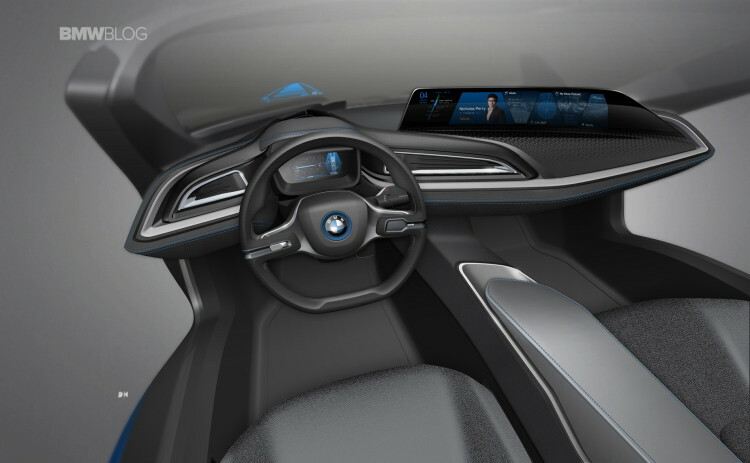 At the CES 2016, the BMW is using the Concept Car BMW i Vision Future Interaction to show what the user interface of the future might look like – including support from high-resolution vehicle displays where the content responds to the situation. In order to make the interaction of the passengers with the vehicle as intuitive as possible, all functions are controlled using touch-sensitive surfaces, gestures and voice. The interior has a thoroughbred, sporty and flexible profile. On the one hand, it supports the driver in manual driving mode with a clearly defined focus. On the other hand, when the vehicle is in its highly automated mode, the interior provides an opportunity to relax in the innovatively designed seats and to make proactive use of the time gained through the expanded content available on the central information display. Drivers look at data such as the charge status of the vehicle batteries or the routes offered before commencing the journey on their smartphone, smart watch or Mobility Mirror. 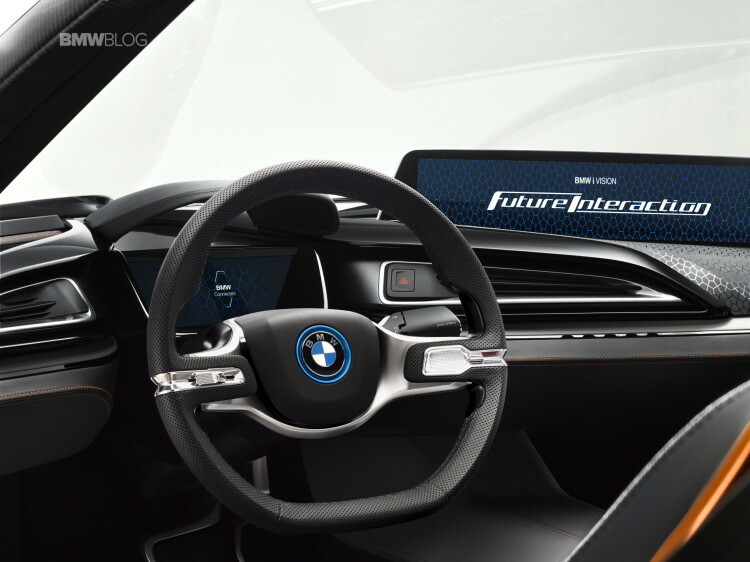 These are then automatically transferred to the appropriate menus, map displays and driver information on the panorama display in the BMW i Vision Future Interaction. The transition from mobile device to display in the vehicle takes place seamlessly. The driver receives key drive information on the high-resolution Head-Up Display, which reflects the most important data such as speed, speed limits or navigation information within the field of vision on the front windscreen. The instrument cluster is located directly behind the steering wheel and information is shown here in three-dimensional display (autostereoscopically). As well as the usual information about speed, consumption and range, the driver is also provided with information here about vehicles on the road ahead or oncoming vehicles which are not yet in his or her field of vision. The driver is consequently able to respond at an early stage to all conceivable traffic situations. This also applies during highly automated driving. If the driver needs to take over command of the vehicle, the system provides an appropriate alert. The technology acts predictively so that the driver has at least five to seven seconds to respond. 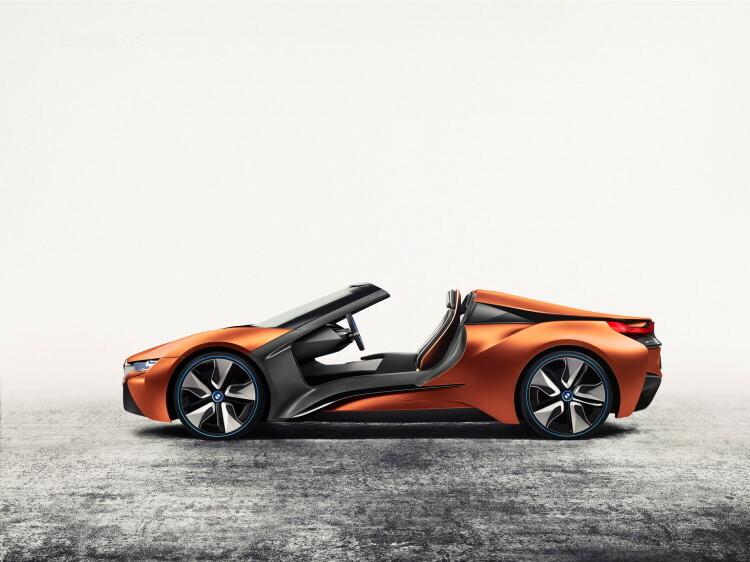 The central panorama display is the most striking interaction element of the BMW i Vision Future Interaction. It extends from the center console across the entire passenger side and appears to flow harmoniously out of the dashboard panel. 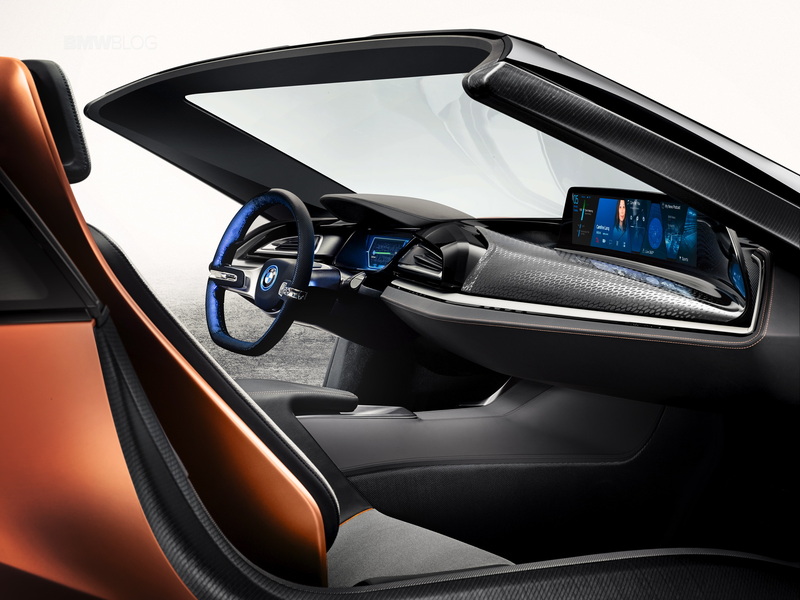 The display height of eleven centimeters means that the dashboard panel is not higher than in the BMW i8 and it permits an optimum view to the front of the vehicle. 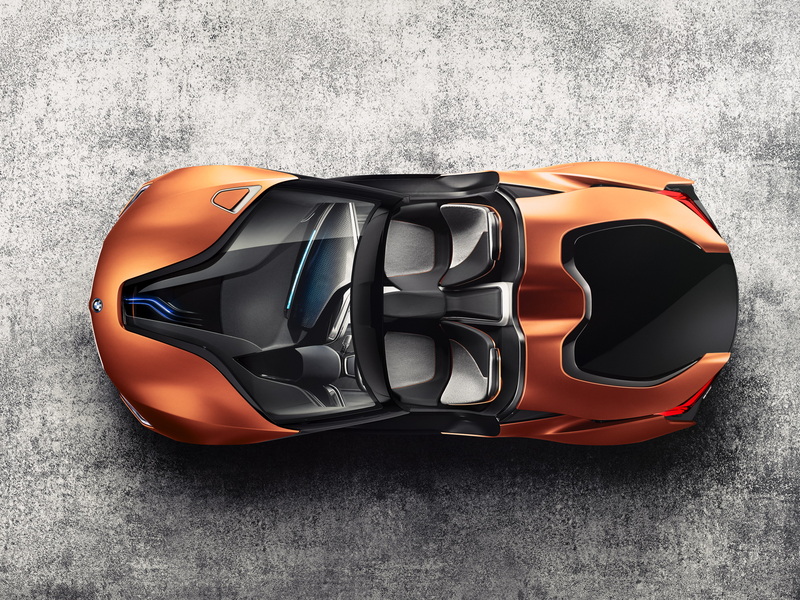 The high-resolution panorama display in the BMW i Vision Future Interaction is almost 40 centimetres wide while the screen diagonal is 21 inches. 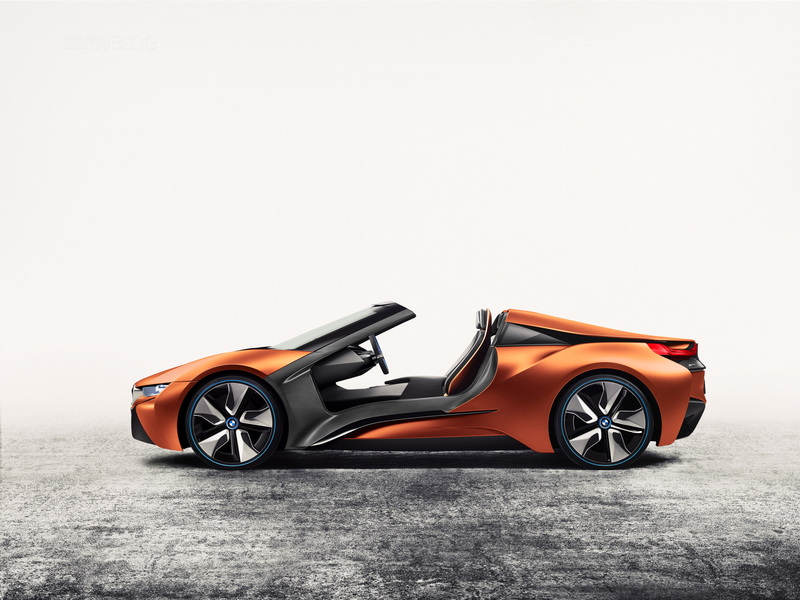 The number of control elements is reduced to a minimum in the BMW i Vision Future Interaction. The most important of these elements – the drive mode selector switch – is located on the left-hand side of the steering wheel. This is used to select between the three drive modes. The “Pure Drive” mode meets the typical BMW high aspiration for sheer driving pleasure at all times. Assistance systems are used passively here and they only give warning alerts without actually intervening in the control of the vehicle. The “Assist” setting provides optimum networking with the surrounding environment. The best route is calculated in real time and fed into the navigation system. The vehicle supports the driving performance of the driver and intervenes actively if there is danger of an event such as a shunt accident, or if an obstacle on the road appears to be a safety risk. When the vehicle is in “Auto Mode”, the vehicle itself takes over control of sideways and forward orientation, accelerates independently, brakes and steers – without the driver having to intervene at all. In the near future, this could already be permitted on certain approved stretches of road, for examples sections of German motorways or in Car Pool Lanes in the USA. The BMW i Vision Future Interaction proactively gives drivers an alert if they are in a zone for highly automated driving. The driver can then change the drive mode as appropriate. The steering wheel is illuminated in blue in the highly automated drive mode. The colour scheme therefore provides a visual cue that the driver is in this drive mode. If the vehicle leaves the approved lane for highly automated driving and has to take control of the steering wheel again, a red light signal conveys this requirement. 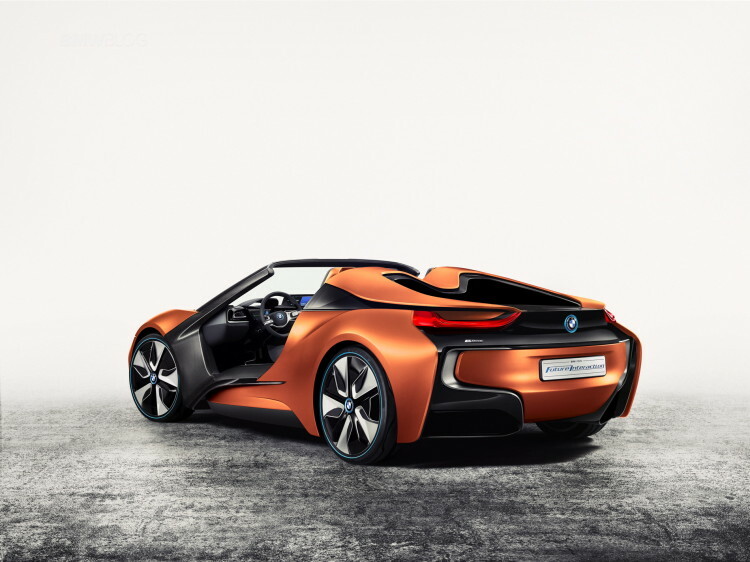 The BMW i Vision Future Interaction is therefore already providing an indication today of what the control functions might look like in the future in highly automated vehicles. The character of the interior changes depending on the drive mode. If the driver changes to highly automated mode, the colour of the steering wheel is not the only thing that changes. When the vehicle takes over control, lots of additional space suddenly becomes available for the people inside. The steering wheel moves forward by several centimetres and this opens up more space. At the same time, the contoured, sculpted sports seat changes its character. Elements in the side upholstery give the seats a lounge profile which enables the driver to turn more to the right in order to look at the panorama display in a more relaxed position. The new freedom of movement is also supported by an extended headrest and the generously dimensioned central armrest. The BMW i Vision Future Interaction uses innovative LifeDrive architecture which is structured with separate function units that operate independently of each other. The Life Module made of carbon-fiber reinforced plastic (CFRP) forms the very lightweight passenger cell. Meanwhile the Drive Modules, which are primarily manufactured from aluminum – drive train, chassis and safety structure – take over the functions relevant for driving. The characteristic binary division of the LifeDrive concept is also reflected in the design and deliberately emphasizes the basic elements. Highly expressive surfaces and precise lines create a harmonious transition from one module to another. The headlamps designed with BMW laser light technology are a defining element at the front. 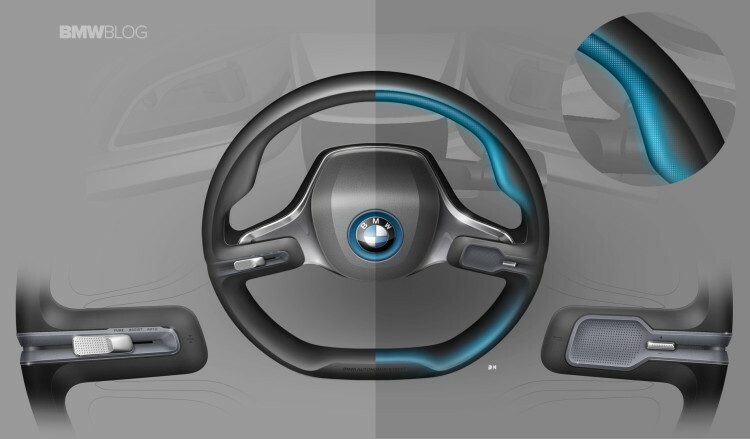 They are configured in the u-shaped design of BMW i. The flat engine bonnet is styled with a V that opens up to the windscreen. It forms the starting point for the typical Black Belt, which continues on the rear cover and constitutes a characteristic feature of the BMW i models. 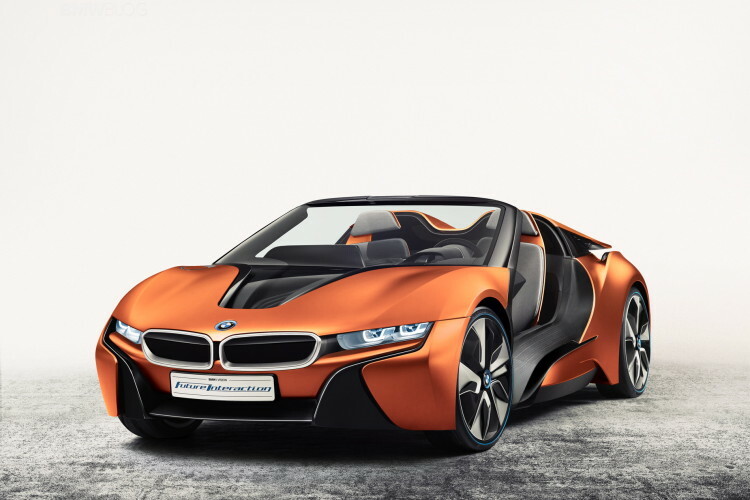 The side view is defined by the short overhangs typical of BMW vehicles. They combine with the wedge shape of the sills to generate the athletic character – contours and lines create a sense of strong forward motion even when the vehicle is at rest. Similar to the front, the rear of the vehicle is flat, while a powerful rear diffusor, air vents in a three-dimensional design and the u- shaped tail lamps with LED technology give the impression of exceptional breadth to the BMW i Vision Future Interaction and define its sporting aspirations. The interior compartment is styled with a mix of color and material made up of plastic, carbon and leather, which creates an aura of high quality, emotionality and thoroughbred pedigree. The seats are upholstered in leather amido and textile, and a leather core made of natural leather. 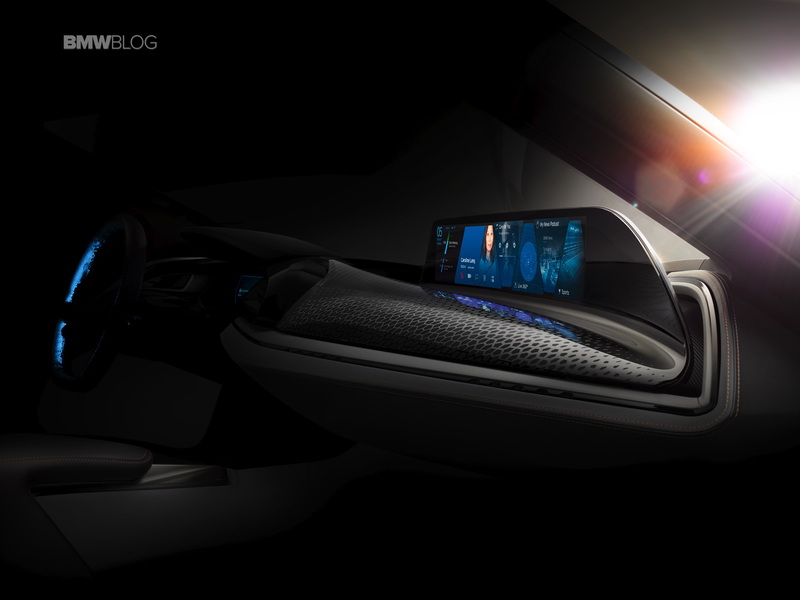 The same leather is also used on the dashboard, combined with a monofilament technical textile which also provides the floor covering for the BMW i Vision Future Interaction. Dark leather amido is combined with semi-aniline leather in Ice Grey to cover the central console. Buttons on the steering wheel made of polished aluminum emphasize the high-tech character of the BMW i Vision Future Interaction.